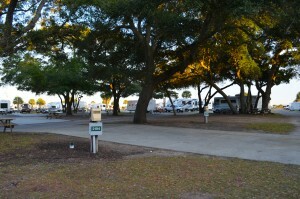 Ocean Lakes Family Campground offers great diversity in camping accommodations. Our rates are inclusive, we don’t add on for people, pets or hookups. Guests have a variety of choices including oceanfront, lakeside, and shaded sites. When calling to make a campsite reservation feel free to ask about the site, our teammates can tell you the site dimensions, how many feet the site is from the ocean, if a bath house is close, even if the site has a tree on it! You can also see several details about each campsite when you do an online site search. Reservations can be made up to 18 months in advance with the required deposit by calling 877-510-1413 or booking online. Make sure you know the accurate length of your camper (including the “tongue” that sits on the hitch of your vehicle). Most of our site are large, but we want to make sure you are not booking a site that is too small for your RV. Take a look at the campsite map and reserve the exact campsite on which you want to stay! Many of our loyal guests have their “Top 10” site list. Some guests want to be right on the ocean, others like to be farther back from the busier main oceanfront road, Seaside Drive. NEW? Our park has “seasons,” when the kids are out of school we are busy, summer season is not for everyone, but when the kids are back in school our park is much more mellow and relaxed. Watch this video, “What You Need to Know About Summer,” and our videos on our YouTube channel to learn more! Tell the Reservations Teammate you want Express Check-In! Allows you to: 1) Bypass the lines in our Registration Office. 2) Simply drive through our Main Gate to your site while we check you in! Express Check-In must be done 2 weeks prior to your arrival date. Pay all camping fees in full. Tell us the number in your party. Tell us your vehicle make(s), vehicle tag number(s), and state(s). We will mail your EXPRESS Packet. It will include your car passes. Hang the car pass on your rear view mirror, drive through our main gate and have fun!